Electric lawnmowers are the most popular type in use, probably because of the power and convenience they offer versus the relatively low price. They are mostly fairly light and easy to use, and also simple to maintain. Electric mowers are generally much quieter than petrol alternatives also. The biggest drawback is obviously an electric mower has to be plugged in to a power outlet, so you are either limited to the cable length, or you have to trail an extension lead around - however for small to medium gardens they are perfect, and for large gardens they will still get the job done. An electric lawn mower is still suitable for large gardens as range is only limited to the length of extension lead you can get, and there are also powerful models available. However for very large gardens consider a petrol or even ride on model. There are 3 main types of electric lawnmower available, each offering different features and benefits. Electric Rotary lawn mowers are the most popular type purchased in the UK. They offer good performance versus value for money as they are amongst the cheapest type. A Rotary Lawn mower cuts the grass by a rapidly rotating blade, that spins paralell with the lawn surface, literally hacking the blades of grass. If you were to look very closely at the blades you would see a torn finish, but the overall result is perfectly acceptable. If you want a striped finish to your cut lawn you will need a model that has a rear roller. Rotary mowers are fairly good at coping with longer grass, as long as the motor is powerful enough to keep the blade spinning rapidly enough. Cylinder mowers offer the very best finish that you can get because of the way that the blades work - the blades cut each strand of grass much like a pair of scissors. Electric Cylinder Mowers are generally more expensive than the rotary equivalent because their blades are much more precision engineered. A cylinder mower with a roller is the ideal way to produce that percent striped lawn. Cylinder mowers tend not to cope with longer grass so well, as they may have a tendency to flatten the long grass rather than cut it, so you may find you need to cut more often. A Hover mower cuts in the same way as a rotary mower, with the horizontal blade spinning quickly and slashing the grass. What an electric hover lawnmower also has is a fan (usually part of the same rotation mechanism as the blade) and a "skirt" which helps trap and direct a cushion of air to make the mower float. This makes a hover mower ideal for uneven surfaces, especially where there is banking. Hover mowers are generally therefore very easy to manoeuvre, as they can go in any direction you wish, unlike their wheeled counterparts. The quality of cut is about the same as with a normal rotary mower. Sometimes hover mowers are not as effective in long grass as it can affect the airflow that creates the cushion to float the mower. Hover mowers can be bought very cheaply, especially ones without grass collection. 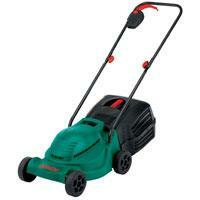 The power of the motor of an electric lawnmower is generally quoted in Watts. The higher the figure the more powerful the motor will be. Look for a more powerful motor if you have a large garden, or are likely to cut the lawn when the grass is long, or damp. Electric lawn mowers are available both with and without a box to collect the grass cuttings, and there are advantages and disadvantages to both. Most models will have grass collection, some of the more compact models, especially hover mowers may not have this facility though. Your lawn will look better when cut if no cuttings are left to go dry and brown. The collected cuttings can be used to make your own compost material. It can makes cutting easier because you are not having to go through grass that was left from previous cuts. It can help prevent weeds from spreading because seed heads are removed. You don't have to stop mid-cut to empty a full grass collector. There is no need to worry about the disposal of the collected grass cuttings. Grass can re-absorb nutrients lost through cutting by the mulching effect of the loose cut grass. Obviously because of the risk of electrical shock it is advised that you never try and repair a faulty mower - always consult a specialist mower repair centre. General maintenance such as making sure nuts and bolts for the wheels are tight etc should be done as a matter of routine before use. It is advisable for all mowers to remove any grass or debris that is stuck to the blades or underside of the chassis after each cut as this is much easier than trying to scrape off dried on grass cuttings. Use a brush from a dustpan set for example to remove anything safely and easily. There are no real special considerations for winter storage, but a dry environment is preferable.